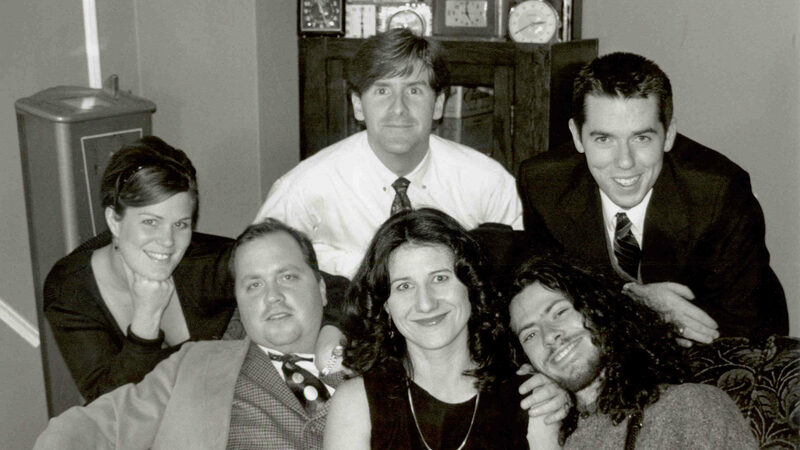 On April 9, six graduates of The Theatre School at DePaul University—led by Nick Bowling and including Brock Goldberg, Kevin Hagan, Juliet Hart, PJ Powers and Pat Tiedemann—gather in a Chicago apartment. They discuss a shared desire to shed new perspectives on the moments, places and forces that define history. After deciding to focus on plays about history that resonate with contemporary issues, they settle on the name TimeLine Theatre. These six founding Company Members each throw $50 in a hat, the seed money for a new theatre company. On December 2, TimeLine Theatre Company is officially incorporated as a not-for-profit company in the state of Illinois. On December 31, TimeLine produces its first event. The inaugural Step Into Time benefit to raise funds takes place on New Year’s Eve at Mars Gallery. After one full year spent developing its mission and establishing an artistic and administrative structure, TimeLine produces its first play, Robert David MacDonald’s Summit Conference, at the Performance Loft of the Second Unitarian Church on Barry Avenue in the Lakeview East neighborhood. [They’re] gambling on history … betting they can find a niche for themselves by specializing in history plays — and unsettling ones at that. … Time—and the vagaries of history — will tell. In August, TimeLine becomes the proud tenant of a performance, rehearsal and office space at Baird Hall Theatre, located inside the Wellington Avenue United Church of Christ in the Lakeview East neighborhood. The space has a storied history as one of the city’s oldest off-Loop theaters. TimeLine inaugurates its new home with the Victorian-era thriller Gaslight, and expands its performance schedule to a three-play season. TimeLine’s sixth production becomes its first official sold-out hit—the Midwest premiere of Tennessee Williams’ Not About Nightingales. TimeLine presents its first world premiere production, Streeterville by G. Riley Mills and Ralph Covert. In June, in its first year of awards eligibility, TimeLine sweeps the Non-Equity Jeff Awards, receiving seven citations—including Production for Not About Nightingales and New Work for Streeterville. The 2001-2002 season marks the first year of TimeLine’s FlexPass Subscription program, which soon welcomes 12 pioneering FlexPass holders, including future Board President Gloria Friedman. In May, TimeLine hires Artistic Director PJ Powers as its first part-time paid staff member. The next month, the company is recognized again by the Joseph Jefferson Committee for excellence in professional theatre, receiving five Non-Equity Jeff Awards, including Outstanding Production, for The Crucible. The world premiere of Kate Fodor’s play about the love affair between Hannah Arendt and Martin Heidegger, Hannah and Martin, becomes a break-out hit. TimeLine will remount the award-winning production in 2004. TimeLine welcomes more than 10,000 audience members throughout a season. During the 2005-2006 season, the company has 682 FlexPass Subscribers. TimeLine produces its first musical. Fiorello!, the classic Broadway musical about one small, honest man’s struggle against corruption in big-city politics, is such a hit, it will be remounted two years later for a second sold-out run. In July, TimeLine’s staff expands to number three full-time positions when Director of Marketing and Communications Lara Goetsch joins Artistic Director PJ Powers and Managing Director Brian Voelker in running day-to-day operations for the company. TimeLine receives the Alford-Axelson Award for Nonprofit Managerial Excellence of a small company, the first arts organization to receive the award. TimeLine also founds the Living History Education Program, under the leadership of Company Member Juliet Hart, bringing TimeLine’s mission to Chicago Public Schools students. TimeLine celebrates its 10th Anniversary by reviving the Step Into Time gala benefit with “Step Into Time: La Belle Époque.” From now on, Step Into Time—featuring themes designed to invite guests to step back into another era—will become TimeLine’s biggest party and fundraiser each year. Elizabeth K. Auman, formerly General Manager at Victory Gardens Theater, joins the staff as TimeLine’s new Managing Director. In March, TimeLine launches its TimePieces Play Reading Series, free one-night-only readings of new or rarely produced plays that fit the company’s mission. During a milestone year that will dramatically affect TimeLine’s future, the Chicago premiere of Alan Bennet’s The History Boys is a smash hit. Opening on April 25 and running for 25 sold-out weeks, the production ultimately helps to double TimeLine’s subscription base and position the company for continued growth. 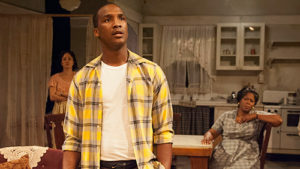 Due to The History Boys extended run at Baird Hall Theatre, TimeLine opens its 2009-2010 season with Arthur Miller’s All My Sons at the Greenhouse Theater Center, which also receives rave reviews. In September, both of TimeLine’s shows in two locations are selling out every night. After 140 performances, The History Boys closes on Sunday, October 18 and on Monday, October 19, sweeps the Equity Jeff Awards in TimeLine’s first year of eligibility, winning all five of the awards for which it is nominated, including Ensemble, Director and Production. Behind the scenes, TimeLine is again honored for its administrative excellence with the Richard Goodman Strategic Planning Award in the Non-Profit category from the Association for Strategic Planning. Terry Teachout names TimeLine his “Company of the Year” in The Wall Street Journal. During the 2010-2011 season, the company welcomes more than 2,300 FlexPass Subscribers. Tickets for the second production of the season—the world premiere of the first play commissioned by TimeLine, To Master the Art by William Brown and Doug Frew—sell out within three days. For the first time in what will become a new normal, TimeLine moves one of its four season shows off-site to accommodate increasing audience demand. The season opener A Walk in the Woods by Lee Blessing is presented at Theatre Wit. The American Theatre Wing (founder of the Tony Awards®) names TimeLine as one of the top 10 emerging professional theatre companies nationwide. 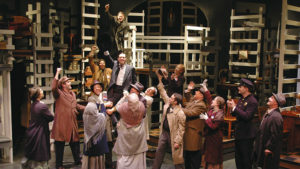 The company is also named “Best Theatre” in the city for 2011 by Chicago magazine. As the 2013-2014 season begins, TimeLine embarks upon its most ambitious fall schedule to date. At TimeLine, Lorraine Hansberry’s A Raisin In the Sun opens in August to rapturous reviews and extends its sold-out run into December. To Master the Art receives a commercial remount, in partnership with the Chicago Commercial Collective and Broadway in Chicago, running at the Broadway Playhouse in downtown Chicago during September and October. And at Stage 773 in October, Larry Kramer’s The Normal Heart starring David Cromer starts an award-winning run. For a brief time, TimeLine has three productions running simultaneously around the city. Also this season, TimeLine launches its Playwrights Collective with an initial cohort of eighth playwrights, offering a supportive environment for writers who share an affinity with TimeLine’s mission to develop new work. TimeLine receives the Equity Jeff Award for Production for The Normal Heart (competing with itself against the also-nominated A Raisin in the Sun), marking the company’s 11th Outstanding Production award within 14 seasons of eligibility. More than 25,000 patrons now come through TimeLine’s doors annually. TimeLine is commended by the American Theatre magazine for its commitment to producing female playwrights. TimeLine partners with a developer to pursue a potential new home in Andersonville as part of a proposal to redevelop the shuttered Lyman Trumbull Elementary School. TimeLine is awarded the prestigious MacArthur Award for Creative and Effective Institutions, akin to the MacArthur “genius grants” received by individuals. On April 9, TimeLine celebrates its 20th birthday and the closing performance of its 70th production, A Disappearing Number, on the same day. With founding Company Members Nick Bowling, Juliet Hart and PJ Powers in attendance, the audience enjoys post-show champagne and a cheesecake courtesy of The Eli’s Cheesecake Company to commemorate the occasion. TimeLine partners with the Illinois Bicentennial Commission and others to present the public art project Rooted in Greatness—a first-of-its-kind video art exhibit showcasing and honoring noteworthy Illinoisans that premieres in August. TimeLine presents its inaugural FIRST DRAFT Playwrights Collective Festival December 1 – 3. 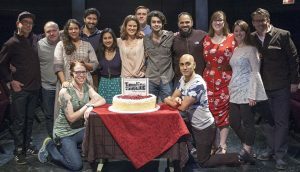 It is the culmination of the the company’s latest two-year new-play incubator program offering residency to Chicago-based emerging and established writers and is a sold-out success. Earlier this year, To Catch a Fish by Brett Neveu had become the first play written and developed through the Playwrights Collective to have its world premiere at TimeLine. On December 21, TimeLine announces that it has completed the purchase of property located at 5033–5035 North Broadway Avenue in Chicago’s Uptown neighborhood. The property is planned as the site of a renovated facility to house the company’s future operations and to support and expand its mission. The 2018-2019 season marks TimeLine’s 22nd Season. From that first $300 thrown in the hat, the company has grown to an annual budget of $1.9 million, 11 full-time staff members, approximately 2,500 FlexPass Subscribers, and more than 75 productions to date. We thank all those who have been a part of this remarkable timeline and look forward to all that is to come! For TimeLine’s 15th Anniversary in 2012, we published a special series on our blog Behind the ‘Line—interviews with the company’s six founders, reflecting on the earliest days. Look back at the more than 75 productions that have been a part of TimeLine’s history since our first show, Summit Conference, in 1998.